For over 150 years, St. Mary’s has been blessed with beautiful and successful schools where we strive to promote Catholic values and mentor life-long learners. Faculty, staff and volunteers at St. Mary’s work to provide our young people with the highest-quality religious and academic education while nurturing the whole person —spiritually, academically, socially, emotionally and morally. 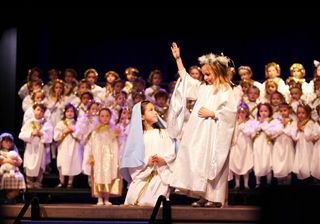 St. Mary’s students are rooted in faith through the school curriculum. Educators teach the Good News of Jesus through curriculum prayer, liturgies, and daily interactions, giving students a foundation to succeed in life. St. Mary’s education programs reflect our religious values while providing a learning experience which imparts to each of our students both the necessary academic and physical skills resulting in the knowledge and attitudes that develop purposeful self-esteem and self-confidence. St. Mary’s students are encouraged to make a positive difference in their community through both independent and school sponsored volunteer service and leadership activities, as well as participating in our many ministries such as altar servers, ushers, cantors, lectors, etc. Many others offer their time to help the poor through the Light House Shelter and St. Vincent DePaul Society. As parents and parishioners, we are “called” to pass on our Catholic faith to the next generation. We stand firm in our belief that a quality Catholic education is more important than ever. It is crucial that our schools, campus ministries and religious education programs teach our young people to embrace the Gospel. We guide them in their journey toward success and hope they become our Catholic leaders of tomorrow grounded in the Catholic faith.